Hook. Check. Line. Check. Sinker. Check. Video games have tried to contextualise fishing through play on many occasions, with varying degrees of success. All the perks of a fisherman's day, without enduring the pests of real-life weather. We won't be looking at any proper fishing games today. It's hard to talk competition when a game is entirely devoted to the meditative sport of angling, as opposed to the mere mini-game afterthought most titles prefer. The following round-up is meant to showcase different approaches to fishing in games where actual fishing doesn't take centre stage. So, without further ado - let's hook at some fish. Fishing in World of Warcraft is by no means revolutionary, but it deserves a place on our list nonetheless because even after a decade, players are still choosing to visit the waters of Azeroth in hopes of catching a fish or two. Like most mini-games in WoW, fishing is a pretty standard affair: you cast your line, wait for the bobber to start wiggling, right click on it - and Bob's your uncle. You've got yourself a fish. But since this is World of Warcraft we're talking about, it's not just fish that you can find in the deep waters; a good number of times, fishing can also yield low-tier equipment, locked chests and even gems and herbs. Even though all of this sounds enticing, it really is not. Fishing is the one profession in WoW that's often neglected to the point that most players never bother with it, as it provides little to no boost to your character's stats. We're guilty of it ourselves, as we found it to be a complete waste of time. Still, if you're a helpless fishing enthusiast and you can't help but flex that fancy new rod you just got the other day, you'll be pleased to learn that almost all bodies of water have some sort of fish lurking around in them, so it's not a question of where when it comes to fishing in WoW, rather, it is a very dry question of why. First, we would like to clarify that in no way, shape or form is Bob our uncle. Having said that, Stardew Valley is one of the most delightful games around, with equally as engaging fishing mechanic. In fact, CJ considers himself a dedicated Stardew fisherman. He found Stardew Valley fishing to be incredibly similar to actual fishing, duh, in that it's simple to learn but hard to master. You'll be catching fish in no time but every once in a while - treacherous seas, rivers, ponds and even sewers will remind you you've still a long way to go before you call yourself a master. You click to cast your line and once you hear the sound, you click to start the mini-game. Your job is to keep the highlighted bar on the fish for enough time until the bar on the right fills up. You can use bait, which slightly improves your chances to catch fish, and add all sorts of tackles, each coming with a specific perk. The amount and variety of in-game fish is staggering. Many of them appear only in specific waters, weather and season, that's how deep, badum-tsss, Stardew Valley goes. In fact, it's so well made that you'd be hard pressed to find an actual fishing game that's as meticulously crafted as this. As far as fishing's correlation with the rest of the game goes, it can be instrumental if you choose it to be. There are missions you have to complete to progress but you can easily make fishing your livelihood. Once our crops withered in the winter, we were laughing at dedicated farmers all the way to the fish market. Rods, baits, crates, rewards, Terraria's fishing feature has the usual fare. Unlike many other games, fishing in Terraria isn't simply a mini-game, offering players a chance to earn powerful equipment using one of nine fishing poles. The rarity of those poles translates to the rarity of your catch. 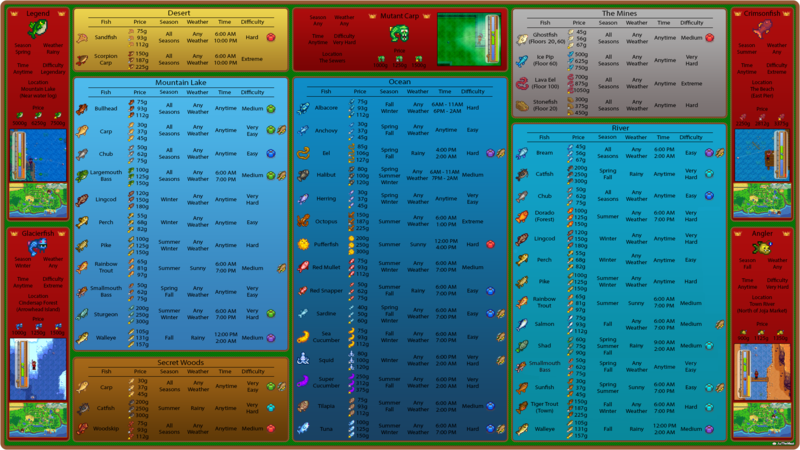 Alongside poles there are special potions players can craft to help them with fishing. Terraria's bodies of water or lava hold many treasures that players can get with a bit of bait and patience. Fishing isn't just plunking your pole into a body of water either, you need to have bait. There are 30 variants of it including, worms and insects which can only be obtained by using a bug net. Notably, this 2D sandbox has a dedicated NPC for fishing. The Angler NPC will give out one quest a day which usually requires a player to catch a fish. Patience is quite rewarding as you can catch a wide variety of fish which can be cooked into food or crafted into potions. There are also crates which contain random loot and items that include weapons or tools which can be high grade or just which is just junk. Unlike in some of the other games we mentioned, fishing in Conan Exiles is rather minimalistic and fairly simple. It consists of players crafting fish or shellfish traps and then laying them into a body of water. These traps will ensnare fish 10 to 15 minutes later and by that time some fish they caught may even rot, leaving players with putrid meat. Now, some may find this disheartening but just about everything is useful in Conan Exiles, so putrid meat can be further used for compost which is required for any planters players craft in order to grow helpful plants. Fishing isn't exactly a mini-game in Conan Exiles, but rather an additional way of crafting and gathering supplies. As such, fishing can be entirely skipped in the game since meat and putrid meat can be obtained in different ways, such as viciously killing any wildlife or humans players come upon. This may even prove more practical at times since players will be fighting the wildlife and other humans regardless, so they might as well loot the meat. On top of it, fishing traps will stop working after a server restart leaving players to craft and place new traps instead. Both Torchlight games have a simple fishing mechanic. It's the usual stuffing, put thing A into watery thing B via rod C and wait for the right moment to click. Fishing spots can be found in towns and overland locations. The fish found in these ponds can be fed to the player's pet, and transform it into friendly versions of otherwise hostile creatures. Once transformed, the player's pet gains all of the abilities of it's host body which can be beneficial to the player in a variety of ways. The quality of the actual catch is dependent on the fishing spot, which translates to increased duration of the transformation effect itself. Pets are a vital component in Torchlight games, and while we wouldn't go as far as calling the fishing aspect of pet wrangling vital, it can turn otherwise difficult fights into a breeze if used correctly. If none of the games we listed can satisfy your thirst for fishing, we suggest you take a look at some of the games that couldn't quite make our list but are still worthy of an honourable mention: Far Cry 5, Ark: Survival Evolved, Minecraft, DayZ.